The majority of Margaret’s life was lived in the palaces and castles of the Kings of England and Scotland. Twice she travelled between London and Edinburgh, and she spent some months in the Borders, driven into exile by fear (perhaps misplaced) of the Scottish Governor, Albany. The numbers against the places correspond to those on the map here and at the end of this article. 1489 in the Palace of Westminster (1). Unlike today, the settlement of Westminster was still separate from London, situated about 1.5 miles west of London Wall, through the great gate at Temple Bar, where Fleet Street and the Strand meet now. The palace itself dated from the eleventh century, and together with Winchester, it was the main seat of England’s mediaeval kings and the only building referred to at the time as a ‘palace’. Over the centuries, the functions of the King’s court, which in early times had taken place wherever the King was, began to settle into permanent homes, the chief of which was Westminster. The Treasury, Chancery and Exchequer were all based there by the early thirteenth century. For Margaret, the palace was the place where she would have visited her parents most frequently, and where some of the important ceremonial occasions of her childhood took place, such as the tournament held in her honour at the palace in 1494. It was also the place where she danced with her brother, Henry, Duke of York, at the wedding feast following the marriage of their brother, Arthur, to Katharine of Aragon. Most of Margaret’s day to day life was probably spent at either Farnham in Surrey, where Arthur had his household until travelling to the Welsh Marches in the late 1490s, or Eltham, where her younger siblings, Henry, Mary and Edmund (who died young) lived. When Margaret returned to London in 1516, she would have seen only the remains of the palace, which had been badly damaged by fire in 1512. It had then been superseded for the royal household by Richmond and Greenwich and, from the mid-late 1520s, by Whitehall and Hampton Court. Over the centuries, what was left of the old Palace of Westminster gradually gained an accretion of new buildings, until the fire of 1834 which destroyed all of it, except Westminster Hall. The Hall, with its great hammer-beam roof dating from 1399, is now incorporated into the replacement palace which serves as Britain’s Houses of Parliament. Two months after Arthur’s marriage, in January 1502, it was Margaret’s turn to be formally betrothed to King James IV of Scotland, in a ceremony at Richmond (2) . Richmond had been built by Henry VII after the destruction by fire in 1497 of the old manor of Sheen. It was largely completed by 1501 and contained apartments for the King; the Queen; the Prince and Princess of Wales (Arthur & Katharine); Henry, Duke of York; Margaret’s grandmother, the Countess of Richmond, and Margaret herself. The ceremony in which she was betrothed was conducted by the Archbishop of Glasgow in the Queen’s Great Chamber, after the company had heard Mass in the chapel. By Margaret’s side stood Patrick, Earl of Bothwell, acting as James’ proxy for the occasion. After the proxy marriage, Margaret, now considered to be Queen of Scots, dined in state, sharing a mess with her mother, the Queen of England. Following the meal there was a joust at which Margaret had the honour of grant the prizes. As Henry VII looked around and saw his beautiful wife, his daughter, now a Queen, his healthy second son and daughter, and thought of his eldest son, Arthur and his wife, Katharine, who were at Ludlow, the King reached the apogee of his life. Perhaps the thought crossed Henry’s mind that a mere five years before, his wife and children had been forced to take refuge in the Tower of London (3) when Cornish rebels had marched on the capital. Their main complaint had been excessive taxation, which Henry had been obliged to levy to raise forces against the man who was now his son-in-law, but who, at the time, had been threatening to support Perkin Warbeck, a pretender to the throne. The Tower, as well as holding memories of that terrifying time, soon after became the scene of an even more sorrowful event in Margaret’s life when her mother, Elizabeth of York, died there in 1503, giving birth to her last child, who died with her. The losses sustained by the royal family in the period 1499 1503 - the deaths of Edmund, Duke of Somerset, Arthur, Prince of Wales, and finally Elizabeth - took a substantial toll on the survivors. It was with some heaviness of heart that, on 27th June 1503, Margaret set out from Richmond accompanied by her father on the first stage of her journey to her new kingdom. The royal party arrived at Collyweston (4) in Northamptonshire, the favourite home of Margaret’s grandmother, Lady Margaret Beaufort, Countess of Richmond. They stayed there for some days being royally entertained, before Margaret kissed her father goodbye and set out for Scotland. She would have known that the likelihood of her ever returning to England was small. The route to Collyweston then, as now, was up the great North Road (the A1). This made it a sensible place for the final farewells as it was on the main road to Scotland. The great manor house itself has disappeared from the landscape with the possible exception of some garden walls and a sundial. Margaret left Collyweston in early July and by the 15th of the month was approaching York (5). In the early 16th century, York was inferior in size only to London and possibly Norwich, although it had started a long decline in both political and economic importance. The city was surrounded by walls punctured at regular intervals by bars (gates). It is possible to walk all the way around the city walls, and it is a fascinating expedition. The road from the south enters the city at Mickelgate Bar. As she rode under the archway Margaret may have thought about her great-grandfather, Richard, Duke of York, and his son, Edmund, Earl of Rutland, whose heads had been impaled above the barbican on spikes after the Battle of Wakefield. Margaret spent two days in York feted by all of the great and the good, not just of the city and the county, but from all over the North of England, and attending Mass in the great Minster of St Peter. She then took the northern road, leaving the city through Bootham Bar. Next to Bootham Bar there is an archway known as Queen Margaret’s Arch. According to legend it was created specifically for Margaret and her very large retinue to leave York. The less-romantic truth is that it had been constructed in 1497 in anticipation of a visit from Margaret’s father. St Mary’s Abbey was immediately to the left of the road, outside the walls. Following the dissolution of the monasteries, the Abbey was reconstituted as the King’s Manor and Margaret’s brother, Henry VIII, stayed there with his fifth wife Katheryn Howard. Later in the 16th century the King’s Manor was the home of Henry Hastings, 3rd Earl of Hastings, Elizabeth I’s Lord President of the Council of the North. He was the guardian of Lady Penelope Devereux who lived there with his family. In 1603, James VI & I stayed in the Manor en route to London after inheriting the English throne and over forty years later, it became the northern headquarters of his son, Charles I, during the Civil War. It is now part of the University of York and is a lovely spot to visit. Margaret finally crossed the border into Scotland at Lamberton Kirk towards the end of July. She continued to progress through the Scottish countryside arriving at Dalkeith Castle (6), home of James Douglas, Earl of Morton, not far from Edinburgh, on 3rd August. It was there that she met her future husband for the first time. Following tradition, James pretended to have been on a hunting trip, coming upon the castle unexpectedly. He made every effort to be kind to his young bride and they quickly discovered a shared love of music. That night a fire broke out in the stables which resulted in the death of Margaret’s own horse. The following day James returned to comfort her and gave her a string of horses to replace those lost. Located on the banks of the River Esk, the castle that Margaret stayed in was replaced in the early 1700s by Anne Scott, Duchess of Buccleuch and Monmouth. Elements of the original building can still be seen in the building now known as Dalkeith Palace. Today the palace, still owned by the Dukes of Buccleuch, is occupied by the University of Wisconsin. Margaret had little time to get to know her new husband before they were married in the chapel at Holyroodhouse (7) on 8th August. Immediately following the wedding ceremony, Margaret, who still had not reached her fourteenth birthday, was crowned Queen of Scots. Holyroodhouse Palace is today the official residence of HM The Queen in Scotland. The Palace itself, built adjoining the Abbey, was largely created by James IV and embellished further by James and Margaret’s son, James V.
It was at Holyrood that the pregnant Mary, Queen of Scots, was forced to watch the murder of her secretary David Riccio whilst her husband, Lord Darnley, held her pinioned. As a modern palace it was very much more comfortable for the Scots Royal family than Edinburgh Castle (8), although not so secure and in times of danger, the castle was still used. The castle today, at the other end of the Royal Mile from Holyroodhouse, is the home of the crown jewels of Scotland, the oldest British royal regalia. The sceptre and sword were both presents to James IV from Pope Alexander VI and Pope Julius II respectively. The sceptre, although subsequently modified in the reign of James V, is probably that which Margaret held at her coronation. James was a generous husband and as well as the lands of Kilmarnock, which she received as her morning gift, he also seems to have given her the lovely Palace of Linlithgow (9). 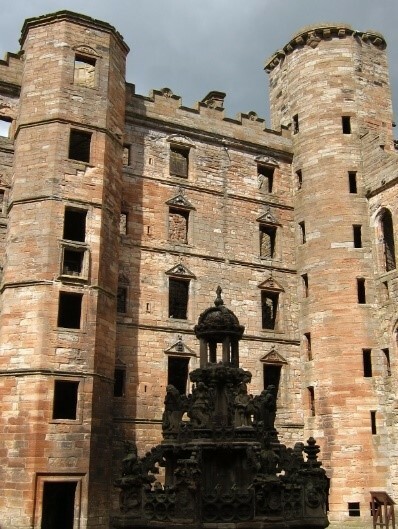 Margaret spent much of her time there and it was the location of the birth of her son, later James V.
According to legend it was in a tower room at Linlithgow that Margaret waited to hear the news of James IV's invasion of England in the late summer of 1513. Unfortunately, the news was as bad as it could be. James and the greater part of his nobility had died at the Battle of Flodden, leaving Margaret widowed before she was twenty-four. Linlithgow today is a stunning red sandstone ruin, reflected in the lake below. It is open to the public, and is managed by Historic Scotland. Before leaving with his army, James IV had made a will appointing Margaret as guardian and Tutrix to their son in the event of his own death. 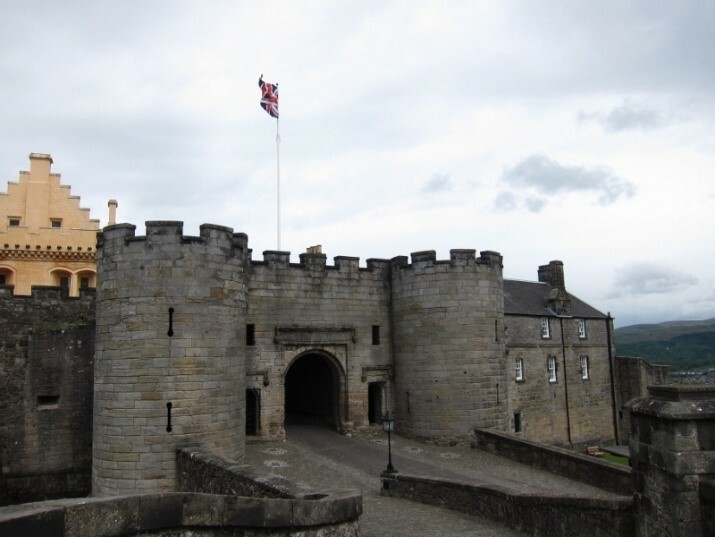 Margaret immediately took control of events and organised the rapid coronation of her 17-month-old son, now James V.
This took place at Stirling Castle (10), one of the most militarily significant castles in Scotland. It was below Stirling Bridge that the Battle of Bannockburn had been fought and it was the location where James IV’s army had defeated that of his father, James III, in 1488. Stirling became an important refuge for Margaret in the years that followed. Less than a year after James’s death, the widowed Queen remarried. As James’ will clearly stated that on remarriage she would lose her position of Tutrix, the Scots lords invited John Stewart, Duke of Albany, to come from France to take up the role of Governor. Margaret resisted all attempts to remove her from her position and in particular to take her two children from her. It is likely that her fears that Albany meant to harm her sons were genuine. Her mother’s brothers, Edward V and Richard, Duke of York, had disappeared once they were in the hands of their Protector, who then assumed the throne. Just as her grandmother, Elizabeth Woodville, had been obliged to hand over her son, so Margaret too was forced to surrender her children and the castle. Margaret, however, was more fortunate in that Albany was an honourable man and had no intention of usurping his cousin’s throne. Stirling Castle is today in the care of Historic Scotland. It has been wonderfully preserved and much of it has been decorated as it might have been in the reign of Margaret’s son and the subsequent regency of her daughter-in-law, Marie of Guise. After Margaret had been forced to surrender Stirling, she became increasingly unhappy in Scotland, and she and her second husband, Archibald Douglas, Earl of Angus, decided that they would escape to England. The Queen withdrew to Linlithgow on the pretext that she wanted to give birth there to the child she was expecting in October 1517. About a month before the baby was due, she and Angus slipped out and rode as fast as they could for the great Douglas stronghold at Tantallon (11) in East Lothian. Tantallon, another property looked after by Historic Scotland, is in an extraordinary position, overlooking the Firth of Forth, with tremendous views over Bass Rock. 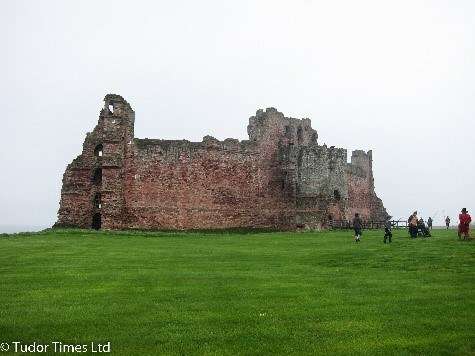 Margaret and Angus remained at Tantallon no more than a couple of days before crossing the border to the remote fortress of Harbottle Castle (12), under the command of Lord Dacre, English Warden of the Marches. It was at Harbottle that Margaret’s daughter, Lady Margaret Douglas, was born slightly prematurely on 7th October 1515, and it was here that Margaret lay ill for many weeks before she was strong enough to be moved to the marginally more luxurious Morpeth. Harbottle today is in a remote corner of Northumberland, just on the boundary of the Northumberland National Park. To reach it, travel along the A697 which runs between the A1, just north of Morpeth, and the A68 at Carfraemill. When you reach the B6431 turn east and then take the unnamed road towards Shaperton. It is a beautiful area of country, but Margaret, trapped by severe sciatica following childbirth, in the autumn of the year, probably did not enjoy her time there. In April 1516, Margaret was sufficiently recovered to travel to London. She had not seen her family for more than 13 years and in her letters she expressed her joy at the thought of seeing her brother again. She travelled south following a similar route to that which she had taken on her northbound journey, although she stopped not at Collyweston but at Stony Stratford in Northamptonshire. It seems an odd route for her to have taken, as Stony Stratford is on the outskirts of modern Milton Keynes, a good 30 miles to the west of the Great North road. From Stony Stratford Margaret probably followed the route of the modern A5, itself on the route of the old Roman road. She reached Enfield on 1st May and two days later, entered the city at Tottenham, as Kings of Scots had been wont to do, perhaps because King John Balliol had held land there. Initially staying at Baynard’s Castle, it is possible that Margaret was eventually housed at what is now Great Scotland Yard (13), near Whitehall. Scotland, as it was known in the 16th century, was defined by John Stowe in 1593 as an area near Charing Cross. According to Stowe, the property was the London house of those Kings of Scotland who had held English lands and consequently attended mediaeval English Kings as barons of Parliament. However the history of the piece of land in question is very unclear and there are conflicting theories about the provenance of the name, including some that deny any association at all with Scottish monarchs. Other than Stowe’s reference to Margaret staying in Scotland Yard, there is no documentary evidence. All of the references to her during the time in question suggest she spent most of her time at Greenwich. Great Scotland Yard became the headquarters of the Metropolitan police in 1829, although they moved to New Scotland Yard, near Victoria in 1890. Wherever she had been staying in London, by May 1517 it was time for Margaret to return home. Once again she set out on the long journey, pausing this time at Berwick-upon-Tweed (14), on the English side of the border, where she was met by her husband, Angus, who had not accompanied her to London, and the representative of the Governor, Albany, who was in France. Berwick, which can best be seen from the window of the Intercity train, as it crosses Stevenson’s superb arched bridge, is on the north of the Tweed, and has been disputed between Scotland and England for centuries, changing hands no fewer than thirteen times. It has been held by England since 1482, although not without continued wrangles, culminating in the building of the great Elizabethan walls, which can still be circumnavigated. Although she attempted to leave Scotland in 1536, when she quarrelled with her son over her desire to leave her third husband, Lord Methven, she was detained near the border and forced to return. She never visited England again. When Margaret had married her third husband, Henry Stewart, James V, although he disapproved, had granted him the title of Lord Methven. He also took the opportunity to give Margaret and her husband Methven Castle (15), near Perth, in exchange for Stirling Castle, which she claimed as part of her dower. Stirling was both militarily crucial to the King and an attractive place to live. Margaret did not do badly from the exchange. Methven, near Perth, is also very attractive. It was at Methven that Margaret died on 18th October 1541. After her death, the castle remained in the hands of Lord Methven, but then passed to the crown in 1584, after which James VI gave it to his cousin, the Duke of Lennox. The castle at Methven now, although delightful, was actually built over a hundred years after Margaret’s death. Margaret was buried in the Charterhouse at Perth, the only Carthusian house in Scotland, founded by James I, where he himself was buried, with his Queen, Joan Beaufort. All of the tombs were destroyed by a mob, during the war of the Lords of the Congregation. The Charterhouse itself was finally suppressed in 1602 and no trace remains. 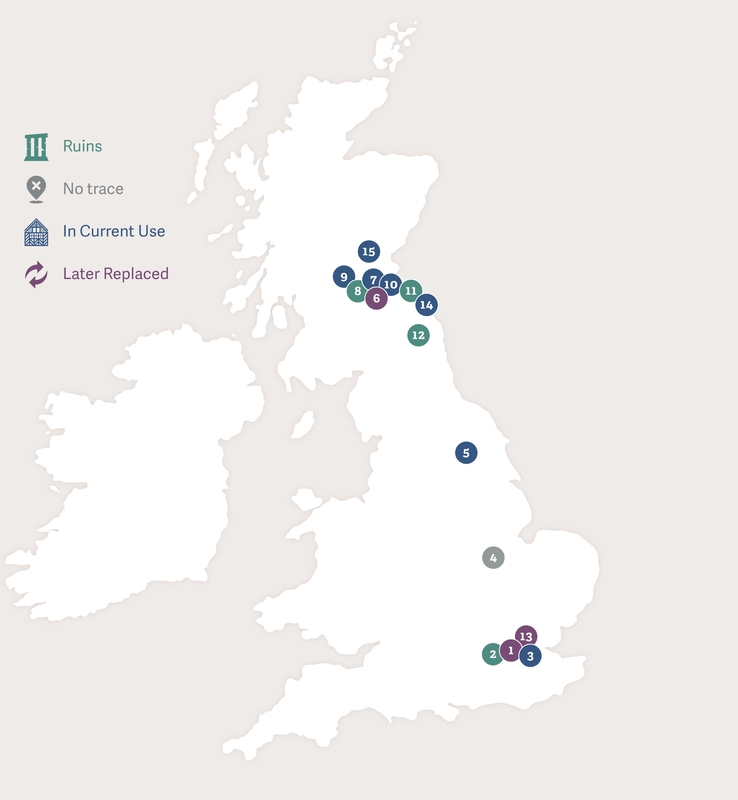 The map below shows the location of the places associated with Margaret Tudor discussed in this article.